People with deep disorders in cognitive functions are supported in their communication behaviors by two classes of devices: Speech-Generating Devices (SGDs) and Picture Exchange Communication System (PECS). SGDs are devices for vocal production and are also known as Voice-output Communication Aids (VOCAs); PECS uses a functional type of communication using the exchange of images printed on paper that show objects (toys, food, etc.). Nowadays, PECS and SGDs are combined in APPs. 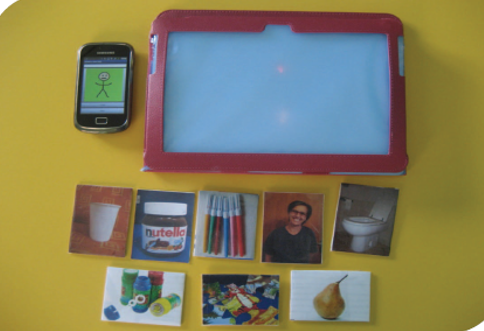 These tools use cards in a digitized version useful for many users with behavioral and cognitive disorders.